"Designed by Miami-based, Brazilian-pop artist Romero Britto, these colorful utensils are the perfect gift for friends and family - or exciting addition to your home kitchen! Plastic. Machine Washable. Set of 4." What we thought: We eat a lot of Asian food...at least once a week. Our kiddos love to use chopsticks, but I'm not to fond of the mess they make while using them and sometimes they get frustrated with the amount of work it takes to get very little food to their mouths. Quite often they give up and resort to a spoon or fork. We were really excited to try SUSHISAMBA training chopsticks and we weren't disappointed. These were colorful and featured fun characters and they were so much easier for the kids to use! I know these will really help the kiddos master eating with chopsticks. My favorite part...way less mess! More food makes it to the kiddo's mouths which makes them happy too:) And these chopsticks are dishwasher safe and durable. The kiddos actually ask to use these for all types of food, not just Asian cuisine...they are THAT fun! ABCD Diaries gives SUSHISAMBA chopsticks an A+! 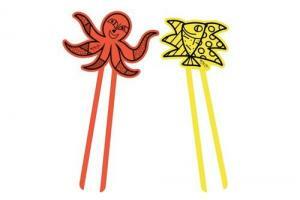 Find these fun chopsticks at SUSHISAMBA! Entered the Pizza Mania Giveaway too!